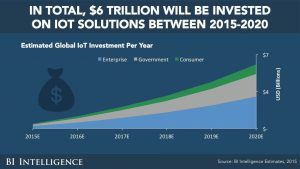 Let’s first take a look what the IoT is, what it could bring to us. In short, IoT means that all kinds of physical devices, vehicles, buildings, … have embedded sensors, software and network connectivity, to be able to collect and exchange data. This could be sensors measuring the temperature at home, or diagnostic data from a car or machine, which are transmitted to a you, to the machine vendor. But it could also be a smart doorbell, where you can see who’s ringing at your door via your smart phone, while you are still at work… Nest Labs e.g. has a number of IoT devices: cameras, thermostats and smoke detectors. Here is an overview of ’20 crazy connected IoT products at CES 2017’, to give you some idea. It is not a new concept: the first internet connected device seems to be a CocaCola machine at Carnegie Mellon University, in 1982… The term ‘Internet of Things’ was first used in 1985. The concept gained momentum a first time in 1999, the Auto-ID Center at MIT was one of the first to put a lot of effort in it. Do you remember what happened on 21 October 2016? That day there was a DoS attack at the DNS provider Dyn. ‘DoS attack’ means: denial-of-service attack. You do this by sending a lot of requests to e.g. a website, so many requests that the server can’t deal with it anymore and becomes unavailable. Imagine a crowd of a hundreds of people trying to enter your home at the same time, via the same, narrow door. Following websites and services were affected by the 21 October attack: Airbnb, Amazon.com, BBC, Box, CNN, Fox News, HBO, Netflix, The New York Times, PayPal, Pinterest, Spotify, Starbucks, Twitter, Visa, Walgreens, Wired. And the list goes on and on… You can read it on the Wikipedia page dedicated to this attack. And even your smart TV set isn’t safe: there are reports that LG TV sets were hit by ransomware. In a survey with security experts, IoT is the number one security prediction for 2017. Just when I was writing this blog post, I got this news: Lloyds Bank is hit by a DoS attack, customers are blocked from the online services of Lloys, Halifax and Bank of Scotland. And just before that news appeared, there was the article about United Airlines, where all domestic flights were grounded, due to ‘a technical glitch in the IT system’. I have no idea whether this was a cyber attack, but it does prove that many companies are completely reliant on IT systems, often connected to the internet, to do business, to function properly. And also hospitals have been under attack. They are an interesting target for ransomware, IoT devices are raising more and more concerns in the healthcare community. As is shown in this article in Healthcare IT News. The financial system, traffic, healthcare, the power grid, if these are attacked by a large zombie army of IoT devices, that could disrupt our society… We are so technology dependent, a malevolent group (or state) could do a lot of harm. A few – rather simple – steps could bring the risk down. First of all, manufacturers of IoT devices should program the software in such a way that it is mandatory to change the default user name and password before a device can be connected to the internet. This would already limit the amount of potential zombies significantly. And second: automatic and regular security updates, with an extensive support lifecycle. For free, not with a yearly service fee, otherwise people won’t take that extensive support. Which will come with a cost and make IoT devices more expensive, but that’s a price we will have to pay. Here are two interesting articles on that: first article, second article. One vendor of IoT cameras has already started a large recall of cameras involved in the Dyn attack. And government is also getting involved, as this article shows. In the USA the Federal Trade Commission (FTC) has filed complaint against D-Link for the lack of security in their IoT products. IoT devices are not only ‘consumer’ devices. How many printing presses sent measurement data to the manufacturer, e.g. to predict maintenance or for benchmarking purposes? Sending data over the internet means these printing presses are IoT devices… Also in the industry IoT devices need to be secure. IoT has great potential, it can improve the quality of life, it can make a lot of things easier. But it comes with a risk if we – the users – don’t pay attention to security. Default passwords must be changed. Otherwise your smart doorbell, your printing press might disrupt your bank, your hospital, your energy supply. And you don’t want that to happen. UPDATE 12/02/2017: Here is an ‘interesting’ example of the danger of IoT devices: an IoT attack on a university, where over 5000 (!) IoT devices (among which refrigerators and lights !!!) starting querying the university network for seafood restaurants… Slowing down the entire network and with the goal to bring the entire network down. UPDATE 23/02/2017: IoT Alliance Australia has released a security guideline for IoT development, as a first step to industry-wide security standards. UPDATE 24/03/2017: PC World just published an interesting article what to look at when starting with IoT: 4 hard truths about IoT. UPDATE 19/04/2017: providers of IoT devices will have to start to take security very seriously: the latest malware will ‘brick’ devices that are not protected or are only protected with the default username/password, rendering them completely useless. UPDATE 26/04/2017: today O’Reilly published an interesting article by David Maher, who has over 30 years of experience in secure computing and is responsible for Research and Development at Intertrust. In his article he advocates a ‘human-centric trust model for IoT’. If you are a developper, you should read it! UPDATE 10/05/2017: a new malware has appeared, targetting over 100 000 IoT cameras. UPDATE 29/06/2017: yesterday CISCO launched a dedicated ‘IoT Threat Defense’. 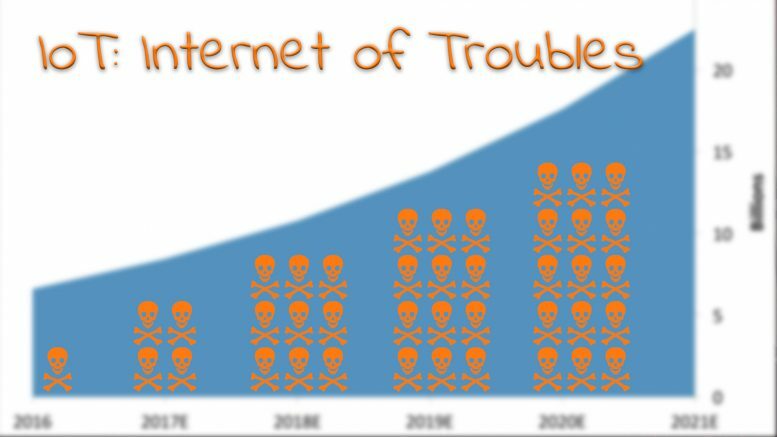 Be the first to comment on "Internet of Things (IoT) will be secure, or it will break our technology dependent society – #InternetOfTroubles"